Monday night: Warm & humid. Low 70s. Tuesday: Another scorcher. Hazy sun with a slight chance of PM thunder. Low to mid 90s. Fourth of July: Warm and humid. Another chance of PM storms. Upper 80s to low 90s. 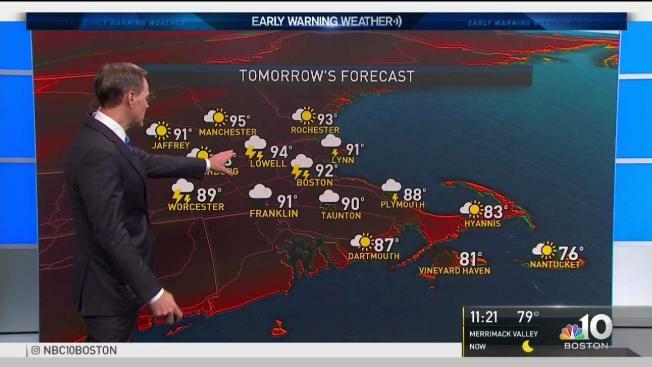 Beyond the obvious of hot weather rolling on for New England, there are certainly some interesting and noteworthy features. The first came predawn in Northern Maine as a damaging thunderstorm roared through the rural country south of Clayton Lake, not impacting many homes or people but a sign the atmosphere is ripe for strong storms when our current heat is ready to break. Later Monday, the highest chance of isolated new thunderstorms will be in Northern Maine and Vermont, while the rest of New England simply looks hot – no clash of hot and cool – so storms generally aren’t expected today. Tuesday a cold front approaches from the north and this changes the atmospheric setup, meaning scattered thunder becomes more likely during the afternoon and early evening, particularly in Central New England from the Lakes Region of New Hampshire southward to the Massachusetts Turnpike. Feeding storm development will be widespread highs in the 90s, including Boston and the coast, as the cooling onshore breeze of Monday will reverse for a southwest wind. Expect a similar setup on the Fourth of July – heat, humidity, haze and the storm-instigating cold front stalling in Central and Southern New England, prompting new afternoon and evening thunderstorm development. This means outdoor plans during the afternoons of July 3 and 4 should include the ability to duck inside as storms roll through. After a quiet Thursday, storms return Friday with a stronger push of cool air that will bring a refreshing change for the weekend in our exclusive Early Warning Weather 10-day forecast.